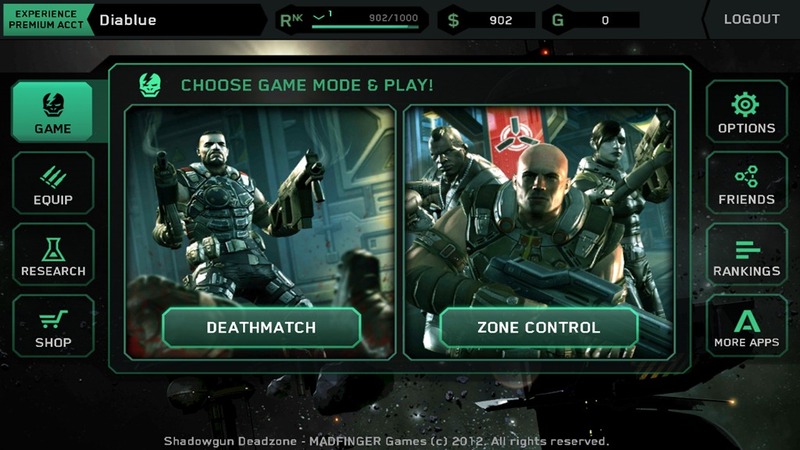 Shadowgun Deadzone is a multiplayer game from Madfinger games that you can play on Android or iOS. Shadowgun Deadzone is multiplayer game in which you battle other people to level you player up and purchase better equipment. The game can be annoyingly addictive and even better it is free. 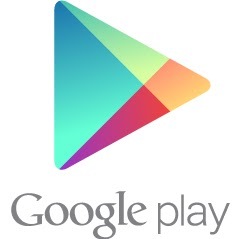 Before you can get into the action you have to download the game from the Play Store or App Store and the download like other games is large, my download was around 120 MB. Unlike most apps to download the game from the Play Store your Android device must have at least 512MB of ram and Honeycomb 3.0 or higher. For iOS your device also needs 512 MB of ram and iOS 5.0 or later. Once you finish downloading the game you need to create a login and this will allow you to play the same character on multiple devices. 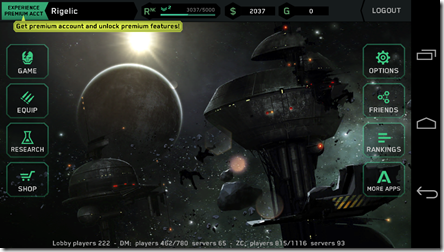 Once you login you will get the main screen where you will see information about you level and how much money you have. From here you can join a game or check out the store to buy items and then equip them. When you click Game you have 2 options you can either play Death match or Zone control. Death match should be self explanatory which ever team has the most kills wins. 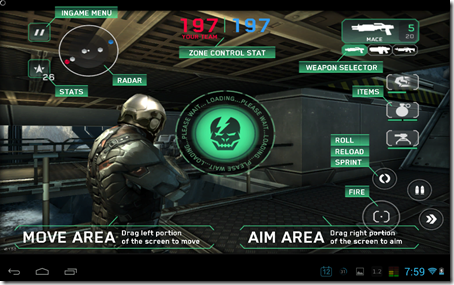 Zone control has many zones to be captured and the more zones your team has the more respawns you get. You try to get and hold zones until the other team is down to zero respawns and that ends the game. When you join a game you will use a HUD (heads-up display) like the one above. Playing the game you use both thumbs to move and look and shoot. On the shoot. You also have additional buttons to roll, reload, and use items like grenades. The game left you move using a joystick and on the right you move your thumb to aim and press the fire button to shoot. At the bottom of the screen you also have a popup menu which contains different commands to other teammates. At the top left you will see a minimap and buttons to view the leaderboard and the overall score. 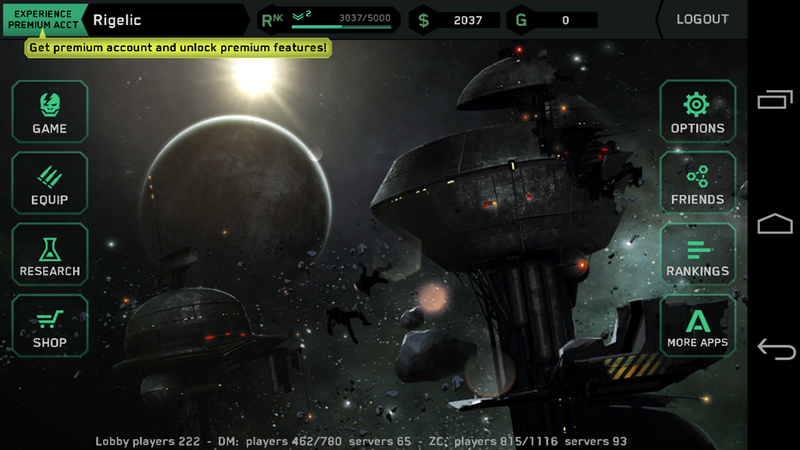 When you are waiting to spawn you can follow other players, and view the leaderboard which show stats for each player as well as what platform they are playing on. The game maps are well designed and not only cover a large area but also offer many different offensive and defensive positions. As you continue to play games and get kills you will get XP and money which will allow you to level up and get new weapons and equipment. You can also change you account to a premium one by using gold to purchase a subscription. The subscriptions are 1 day for 200 Gold, 3 days for 550 Gold, 1 week for 1100 Gold, 1 month for 3990 Gold, and 3 months for 10800 Gold. You can purchase gold at about 700 Gold for $1 or they have free offers that you can sign up for to get gold. I haven’t seen the need to upgrade my account to premium so I have not tried to get gold. 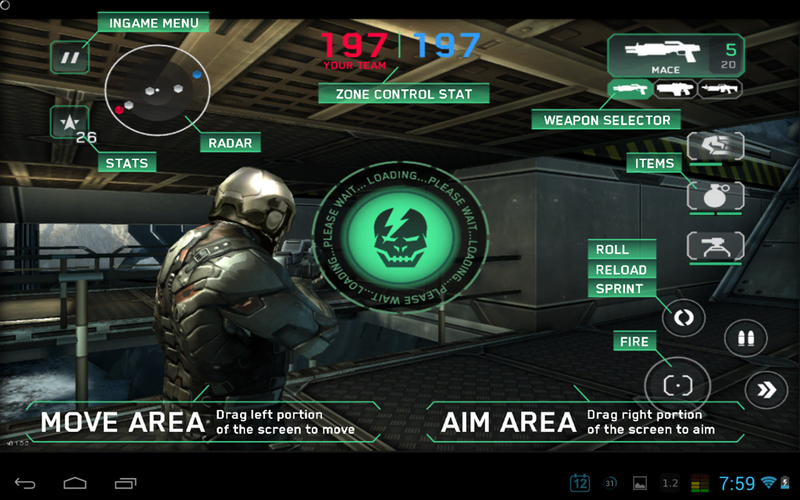 Overall I am very pleased with the new Shadowgun game and the multiplayer action. Even though it took me a while to get used to the controls this game seems to be as good as a console game. For anyone with a newer mobile device and the need to shoot someone this game will give you hours of fun no matter where you are. You happen to be really a perfectly site owner. The web page packing speed will be amazing. It would appear that you happen to be accomplishing virtually any one of a kind technique. On top of that, The material are must-see. you have carried out a wonderful endeavor on this issue!